What time is it? Telling time is such an integral part of each day that we often don’t think consciously about it. Kids depend on us adults to tell them when to get up, when to go to school, go to bed, and go to lunch and recess. But as they get older they’ll learn that life runs by the clock and they’ll have to keep in step. 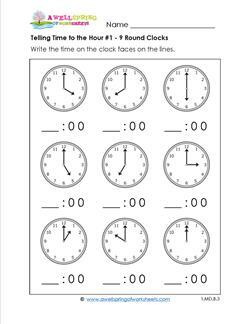 These worksheets are one of the first steps in teaching the essential life skill of telling time. Please go to this page to choose from all the math worksheets on this site. Telling time to the hour is the foundation for learning how to tell time to the half hour, quarter hour, and minute. 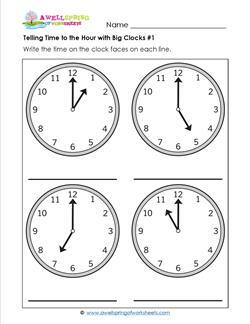 These worksheets were created with differentiated instruction in mind: bigger clocks with nine problems per page, smaller clocks with twelve problems per page, and even smaller clocks with sixteen problems per page. Great for assessments, too! Answer sheets are included for your convenience. 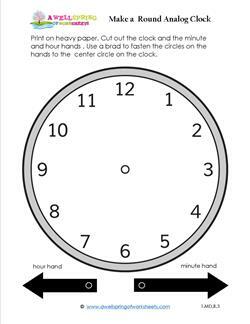 Telling time to the half hour is the next step (after telling time to the hour) in becoming proficient in clock reading and time telling! These worksheets have pictures of clocks with times to the half hour. Kids write the time on the lines under each clock as 5:30, 7:30, 12:30, etc. Three worksheets have nine problems per page, three have twelve clocks per page, and three have sixteen problems per page. Answer sheets are included. 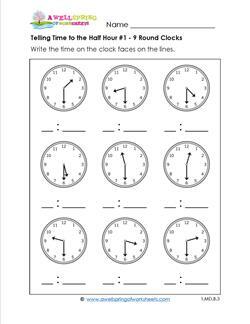 These telling time with big clocks worksheets may be just what the doctor ordered! Big round clocks with long hands pointing to the numbers make it easier to see the time. For younger kids just beginning to tell time or kids with special needs, a large space is provided to write the times on the lines. These include three worksheets of telling time to the hour and three worksheets with telling time to the half hour. Answer sheets are included for your convenience. Get out the pencils and get ready to draw some hands! Minute and second hands, that is. 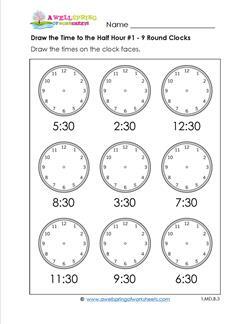 These draw the time to the hour worksheets have pictures of wall clocks, alarm clocks, and table clocks with a time underneath each clock. Kids draw the time on each clock. Three worksheets have nine problems per page, three have twelve problems per page, and three have sixteen problems per page. You can use these for your differentiated learners or for all your kids as they grow in their time telling skills. Answer sheets are included. Kids love to practice their time telling skills. This set of draw the time to the half hour worksheets adds the extra challenge of drawing the time to the half hour, not just the hour. These can be a little tricky as the hour hand often gets drawn in the wrong place. Being extra careful and having lots of practice will help your kids master this skill with flying colors. You can have kids check their answers against the answer sheets. 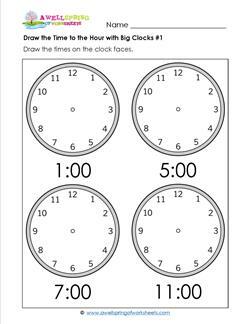 These draw the time with big clocks worksheets were created specifically for kids with special needs in mind. The clock faces are large so they can be easily seen and the lines for the hour and minute hands have plenty of space to be drawn. Practice for drawing all twelve hours of time to the hour and half hour are included. Check the answers against the answer sheets. Your kids can make a clock of their own! The clocks in this set include both analog and digital clocks. The types of analog clocks are wall clocks, mantle clocks, and an alarm clock. They have hour and minute hands. The digital clocks are an alarm clock and an iphone. They have a strip with three times on them. There is also a traditional watch and a digital watch. Small brads are needed to make the interactive analog clocks. 6 different styles of analog clocks, 3 different kinds of digital clocks, watches included.